It’s Saturday…yay!! I live for the weekends. As soon as Monday morning comes around, I’m counting down the time until 4:30 Friday afternoon rolls around. Not that the weekdays and working are so terrible, but let’s be honest…working all week, plus the commute, going to the gym, bible studies, and all the other daily tasks doesn’t leave much time for fun time. The weekdays are busy. That’s just the reality of life. So, I look forward to the weekends when I can spend time with J and the pups without having to worry about getting to bed and waking up early to start another day. Of course there is still chores to be done…laundry, yard work, and such. More joys of being an adult. But there’s fun stuff too. And cooking. Even though I do that every day, I have more leeway to do so and still have good daylight to get good photos. During the week, that is a serious challenge with our schedules. Weekend lunches are usually when I get the best photos. 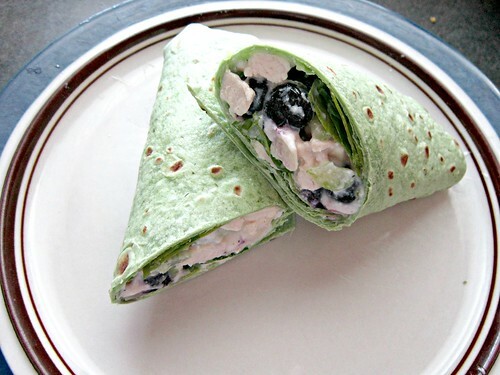 Like these wraps. Blueberries? In chicken salad? Sounds weird, right? But really, it’s not much different than adding apples as far as the addition of fruit goes. It is, however, freaking delicious. Especially wrapped in a spinach tortilla. I’m just sayin’. Oh, and other than cooking the chicken, which doesn’t take very long, it can be thrown together in a flash. You can have these babies on the table in about 15 minutes, even with cooking the chicken!! That’s what we like around. Quick and delicious! It was a last minute decision to use the spinach wraps. I had bought them for another recipe and didn’t use them all so I figured hey, why not? And let me just tell you…that was a good call. This is a great, healthy lunch, packed full of flavor! In a medium bowl, stir together the yogurt, mayo, celery and salt. Warm the tortillas then top with 1/4-1/2 cup of baby spinach and kale and 1/2 cup of the chicken and blueberry salad mixture. 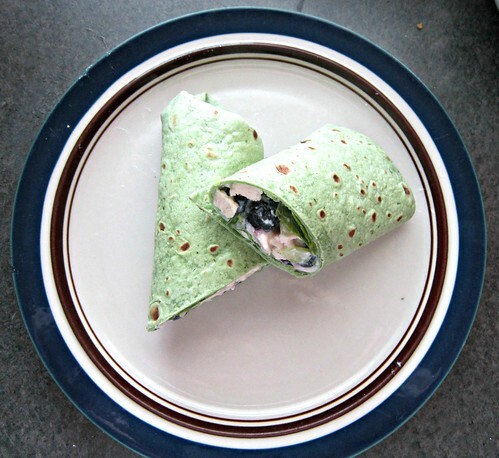 Roll up each tortillas (fold two sides in towards the middle, then fold the bottom side up and roll to the other side to make a “burrito”) then cut in half and serve.